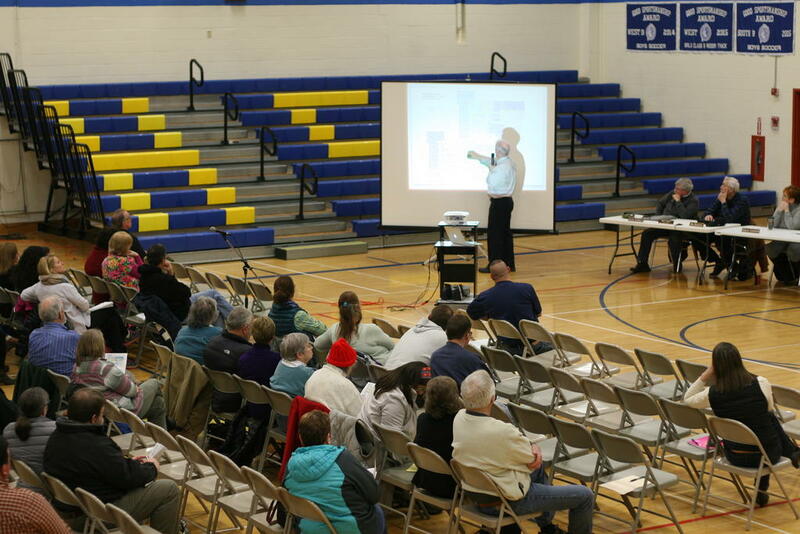 Residents of Bridgton, Casco, Sebago and Naples met Tuesday to discuss a $7.8 million renovation for the former Crooked River Elementary School in Casco, which is set for a vote on Tuesday, April 12. School Administrative District 61 looks to alleviate overcrowding at the Songo Locks Elementary School in Naples first by renovating the Crooked River school and then shifting 250 third-, fourth- and fifth-grade students from Songo Locks Elementary to the new school. The board’s original $9.6 million proposal to renovate the school, on Route 111, was rejected by district voters in December. Commentary at the meeting was largely divided between parents and residents eager to see the young children at Songo Locks in a better school environment, and those who believe the price tag is still too high. Songo Locks Elementary, originally built to accommodate about 380 students, now holds approximately 450 students in grades K-5. The cramped quarters have created an unsafe and uncomfortable environment for students, teachers and staff, according to Superintendent Al Smith. The hallways are crowded with students and their belongings, he said, and small groups of students work in closets and in one instance, a trophy case, to accommodate for the lack of space. Crooked River, an elementary school until about seven years ago, is still used for alternative high school and adult education classes. In a leaflet handed out at the meeting, the district states that when the school was last used to house three grades of elementary school students, seven portables were needed to provide adequate programming space. The board’s new proposal has cut the cost for renovations at the school by approximately 20 percent by eliminating the auditorium, wood-pellet boiler and field improvements, as well as reducing the square footage of the library and kitchen. The new proposal still calls for $3.2 million in new construction and $2.3 million in renovations to the building. If renovated under the most recent plan, the Crooked River Elementary School woould be able to house a maximum of 350 children. But because the district tries to maintain a classroom size at the elementary level of 18 to 20 students, it would likely accommodate 300 students “for practical purposes,” Smith said. According to the school department, the annual cost for the project would increase annual property taxes on a property valued at $200,000 by $42 in Casco, $40 in Naples, $46 in Sebago, and $58 in Bridgton. The cost for each town is determined by the same formula used to determine tax contributions for the annual school budget. Proponents of the proposal largely cited the urgency of the overcrowding at Songo Locks as a reason for adopting the proposal. Many residents in favor of the proposal, such as Gary Lewis from Casco, said they saw the proposal as a long-term fix to the problem of overcrowding. Chris Roy from Bridgton expressed support for the proposal, and said good schools will attract young professionals to the area. Schools are “a primary driver for economic development,” Roy said, adding the town would need to invest in schools in order to be successful. Allen Crabtree of Sebago told the school board the plan “is too expensive and will take too long” to relieve the overcrowding at Songo Locks. If the plan is approved, the projected completion date for construction at Crooked River is December 2017. Crabtree suggested looking at a cheaper alternative, which would add 4,000 square feet to the building at a price of $4 million, and increase the capacity of Crooked River to 250 students. Crabtree also suggested exploring a plan discussed in May 2015 that would put a kindergarten through fifth-grade school in each district own town. This idea – that Casco students would attend Crooked River, and Naples students would attend Songo Locks – was discussed a number of times throughout the evening. Naples and Casco have been combined at the elementary school level since 1991 to allow for the sharing of resources such as textbooks. Smith said the May 2015 plan was a “rough estimate” and the later costs for the project were much higher than the $7.8 million proposal. The May 2015 plan did not take into consideration renovations within the building. Renovations in the building include approximately $125,000 to bring the school up to code, according to Architect Stephen Blatt. It will cost nearly $80,000 to implement a sprinkler system, which is required in new elementary schools by the state. Other objections to the plan included the cost, which was considered to be too expensive for senior citizens and those on a fixed income. While Sebago residents expressed concern about the costs of the proposal during the meeting, no Sebago resident addressed their effort to pursue withdrawal from the school district following a vote in February. The withdrawal is led by Friends of Sebago Elementary School, which said the Crooked River Elementary renovation would threaten the future existence of the K-5 elementary school in Sebago. Denise Olsen, head of Friends of Sebago, said the withdrawal process is a way for Sebago residents to negotiate security for the town ensuring the district will not close the elementary school and relocate students to Crooked River Elementary. Casco Selectman Grant Plummer, who earlier stated his support for the proposal, expressed concern that because of the Sebago withdrawal process, the district is “not working toward the same goal right now,” he said. He said he worries that Sebago residents are opposed to the renovations not solely due to cost, but also due to the “threat” that their school will be closed. If the Crooked River renovation proposal fails on Tuesday, Smith said the board will “go back to the drawing board” to revise the proposal. In the meantime, the district will look into leasing portable buildings to temporarily relieve the overcrowding at Songo Locks. The portables, Smith said, cost roughly $50,000 each year to lease and come with a number of safety issues. The 10-year life span of the portables means they are a temporary fix, he said. School Administrative District 61 Superintendent Al Smith leads a discussion of proposed renovations to Crooked River Elementary School. The $7.8 million proposal is set for a vote Tuesday. The former Crooked River Elementary School on Route 11 in Casco may see major renovations pending an April 12 vote.